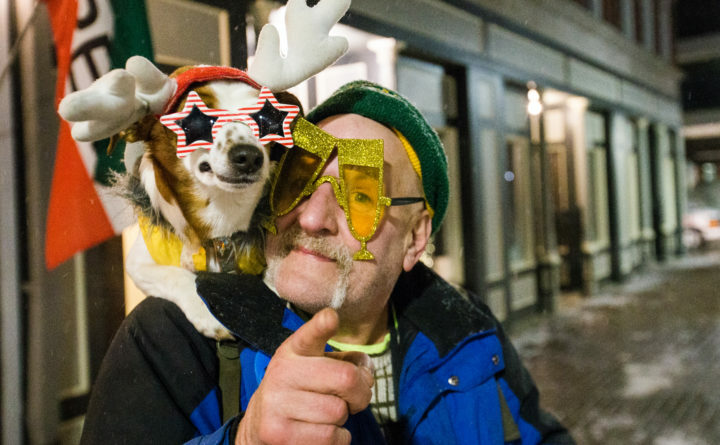 Scrappy and his human Mango, both of Bangor, dressed to impress during New Year's Eve Downtown Countdown celebrations in Bangor, Dec. 31, 2018. New Year’s Eve is a day to celebrate the accomplishments of the year that has passed and make goals for the year to come. For many of us who are concerned about the state of our planet, one of those goals may be to be more sustainable. What better day to get started than New Year’s Eve? According to the Centers for Disease Control, Americans throw away 25 percent more trash during between Thanksgiving and New Year’s Day than any other time of year. Robert Lilienfeld, sustainability consultant and former editor of Use Less Stuff, suspects that given the ubiquity of pomp and circumstance that surrounds Thanksgiving and Christmas, New Year’s celebrations are not as wasteful as the other holidays around this time of the year. Still, there are a few simple ways to reduce the environmental impact of your New Year’s celebration — and set sustainability goals for the year to come. If you are planning on throwing a party for New Year’s Eve, you can make conscious choices for a more sustainable party. Use reusable glasses for champagne instead of disposable glasses. Consider buying organic champagne, which are made with grapes grown using biodynamic methods that are healthier for the regional ecology. Make your own noisemakers and decorations; Lilienfeld suggests putting some of those Christmas tinsel, garland and ribbons to use one more time before boxing them away for next year (decorations should be reused from year to year, and opt for decorations made from renewable, biodegradable materials instead of plastics when you can). Like with Christmas, Lilienfeld encourages conscious meal planning at any New Year’s gathering. He recommends serving food buffet-style, and planning future meals based around the meal’s leftovers in order to decrease food waste. Fireworks are another aspect of New Year’s Eve celebrations that have a noticeable environmental impact. The chemicals used to propel and color fireworks are often toxic or carcinogenic. According to Bill Magavern, policy director at the Coalition for Clean Air, heavy metals and particulates from fireworks can linger in the air, seep into the soil and trickle down into waterways. Large-scale fireworks displays have been shown to impact air quality for days after the celebration itself. George Allen, chief scientist at the Northeast States for Coordinated Air Use Management, says that the small-scale fireworks displays that have become part of some people’s New Year’s Eve tradition can be even more harmful to human health because of their proximity. Lilienfeld also cautions against DIY displays for the sake of fire safety, especially in dry areas that are susceptible to fire damage. Floating paper lanterns are a charming — albeit, quieter — alternative to fireworks, but Lilienfeld emphasizes that they should be collected after they are released. “If you don’t collect them all, they clog up waterways,” he says. The same goes for other paper products, like confetti. Opt against glitter and plastic confetti, as they are microplastics that eventually find their way into waterways and damage the fragile ecosystems. New Year’s Eve is a great day to kick off more eco-friendly habits with a few simple changes. “The value of New Year’s is the reflection time that it provides,” Lilienfeld says. When you raise a glass to toast this New Year’s Eve, take stock of the habits of the past year and resolve to make more sustainable choices in the new year.